Ports and Shipping Minister Mahinda Samarasinghe is day-dreaming of abolishing the civic rights of former President Mahinda Rajapaksa, General Secretary of the Ravana Balaya, Ven. Iththekande Saddatissa Thera said. Speaking to media he said if some one tried to interfere with the civic rights and political future of Mr. Rajapaksa, they would have to face the consequences. “Being the only person who saved the country from the 30-year civil war, this government is planning to infringe his Democratic rights,” the Thera said. He said that Minister Samarasinghe had told that Mr. Rajapaksa could be jailed for seven years. “We challenge the Minister to abolish the civic rights of former president or send him to jail for at-least one day if he could. 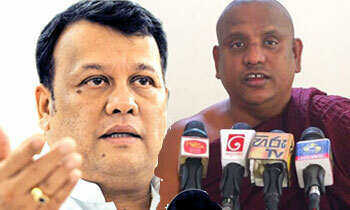 On that day, the Buddhist monks will take to the streets in the Colombo city,” the Thera said. Haamuduruwane please be silent and follow what is stated in Dasa Raaja Dharmaya.. Why defend indefensible? Only those with slave mentality. Maha Raaja spending money lavishly. Money talks loudly. So the sangha would obstruct the law?